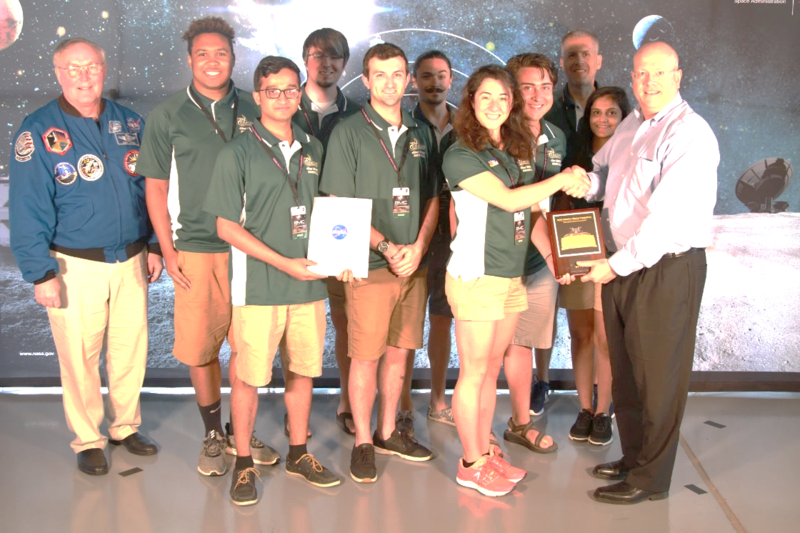 The UNCC Astrobotics Robotic Team, the 49er Miners, took third place in the Caterpillar Autonomy Award at the 2018 NASA Robotic Mining Competition at Kennedy Space Center on Friday May 18th. The team joined the elite group of only a handful of schools in the history of the competition that have accomplished a fully autonomous mining run (approximately 50 colleges and universities have competed each year over the past 9 years). Off-World Robotic Mining Team accepting third place for autonomous operations from Caterpillar Program Manager Eric Reiners and Astronaut Jerry Ross. Photo from NASA photographer. 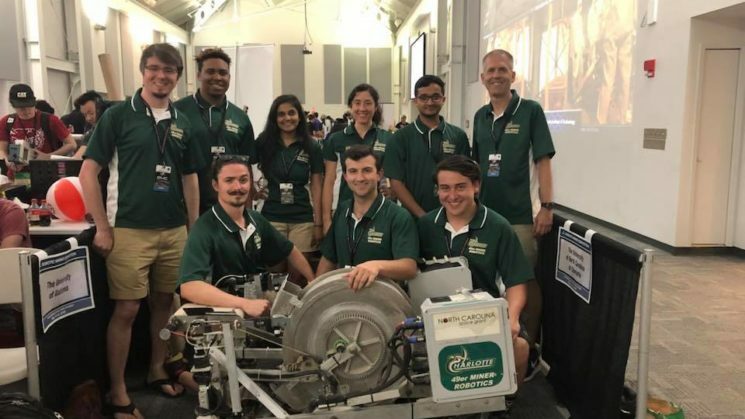 Last August, a team of seven interdisciplinary students from UNC Charlotte’s College of Engineering came together to form this year’s team as part of The University of North Carolina at Charlotte’s William States Lee College of Engineering’s Senior Design Program. Their mission was to program a robot to traverse an obstacle field of Martian soil, mine it and deliver back to the starting location. Autonomous operations is an important aspect of the mission, meaning the rover must use its own sensors and code to complete the mission without further commands. 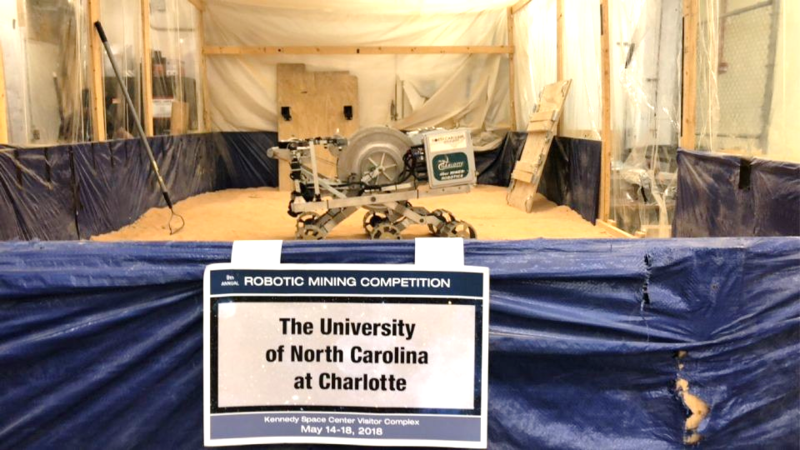 The team inherited the rover used in competition over the past four years by previous UNCC teams; as has occurred each year, they upgraded and modified the design, and then practiced using a student-built arena of sand to simulate mission operation. At competition last year, the rover suffered severe damage and wear to the systems that allow for digging and depositing of the regolith. After project mentor Dr. Aidan Browne briefed this year’s students on the history of the rover, the team followed the Systems Engineering process to decide which aspects to repair, improve, and replace. With assistance in the form of a grant from the North Carolina Space Grant Consortium (NCSG), the team was able to purchase all the materials needed to complete the machining and assembly of their modified rover. Additional funds from the NCSG, the Senior Design Program and the UNCC Student Government covered the team’s travel expenses for their week’s stay in Florida at the competition. Ashley Thrower, systems engineering student, led the project this year ensuring the team used a systems engineering perspective to focus on the improvements, autonomy, and additional mission functionality. Shawn Sharkey and Elijah Pfeifer, mechanical engineering students, established design improvements for the collection system, resulting in new lifting arms and winch system. Mechanical engineering student Michael Bennett led the redesign of the conveyor system (previously destroyed during the 2017 competition) which allows for the regolith to be transferred into the collection bin.